Mystery Case Files is a renowned games series that you can trust to get fabulous graphics and entertaining and addictive story and some interesting puzzles! This release is no different. 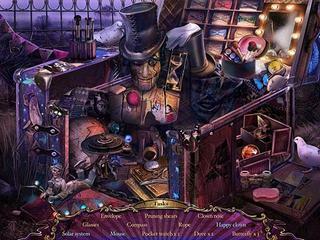 Mystery Case Files®: Fate's Carnival is a festive hidden object puzzle game that you shouldn't miss! You get an interactive map that transports where it's needed, and a very unusual Journal, and a Shop. Please explore all of those! The story of this installment brings you back to the Carnival where you sold a case some time ago. You are going to meet Madame Fate once again there to be warned about all the trouble of the curse that is now on you. Your job is now to find who's behind it and rescue all the performers. The game's audio-visual presentation is gorgeous (as always). The scenes are very magical and detailed, and the colors of the scenes can be even adjusted. The animation adds to the creepiness of the game, too. The mechanics of the game are very convenient. You get an interactive map that transports where it's needed, and a very unusual Journal, and a Shop. Please explore all of those! The game is full of hiddne object scenes (mostly lists) and just hidden items for different purpuses. All that needs to be found, and that is not always easy! The mini games are fun, and some are more challenging than the other. There are also collectibles and achievements and other CE content. The game is really magestic and very well put together both in its story and content! 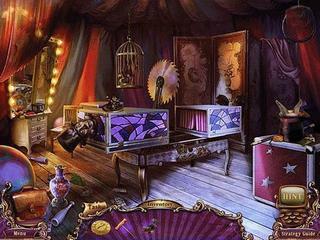 This is Mystery Case Files�: Fate's Carnival review. Download this game here.